Please contact us if you would like our assistance with your placer project. We can get involved at any level, from providing advice to planning, implementing, and running an operation. 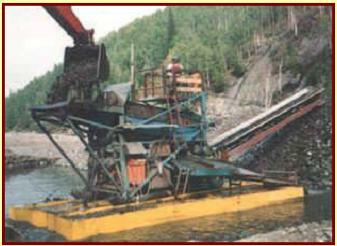 * Beginning in 1988, we experimented with a prototype dredging operation using floating gravel processing plant and a land based excavator. 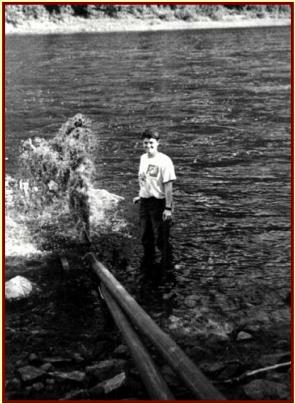 We went on to establish a floater dredging operation on the Fortymile River. * We developed a preliminary plan for generating hydro-electricity using water flow from the river. This power would then be used to dredge the submerged reserves of the river in the vicinity. 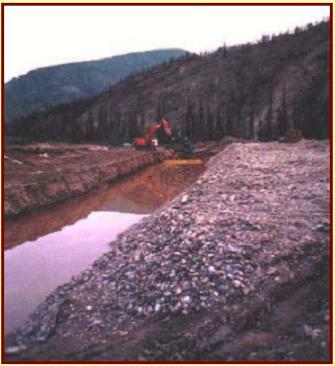 * We published a report " PLACER GOLD DREDGING USING AN EXCAVATOR AND FLOATING PROCESSING PLANT" and a video on the floater mining method for the Canada/Yukon Mineral Development Agreement in 1993. As result this report and video, there are a number of successful operations of this type in the Yukon and northern B.C. These operations are producing several thousand ounces of gold annually. We have acted as consultants to set up a mining operation of this type in Alaska. *We have experimented with the concept of applying floater dredging technology to the mining of frozen placer gravel deposits in permafrost areas. We initially tested the idea in 1994 for the Canada/Yukon Mineral Development Agreement, producing a report entitled, "TESTING THE VIABILITY OF FLOATER DREDGING IN FROZEN GROUND". We subsequently established a successful floater dredging operation in frozen ground on the Fortymile River. *We did a study called "USE OF DIFFUSER SYSTEMS FOR DISPERSION OF PLACER MINING EFFLUENT" in 1996 in co-operation with the Canada/Yukon Mineral Development Agreement. * We field tested placer effluent diffusers in 1997 for the National Research Council. Our work is documented in a report entitled "FIELD TESTING PLACER EFFLUENT DIFFUSERS ON FORTYMILE RIVER". We have also experimented with increasing gold recovery by using centrifugal concentration, a Department of Regional Industrial Expansion initiative. We worked with the Canadian International Development Agency in Costa Rica to investigate the suitability of floater dredging in Central America as a means of mitigating environmental impact. * Our operations were found to have the highest rate of gold recovery in a study carried out by the Department of Energy, Mines and Resources in 1987. * A study by the Klondike Placers Miners Association in 1989 found our mine to be one of the most efficient in fine gold recovery in the Yukon. * In 1994, our floater dredging operation was selected by the Yukon Department of Economic Development, Mineral Resources Branch, as a model of exemplary environmental mining practice. Please contact us to discuss your project if you are interested in our consulting services. This phototgraph shows the floater dredging plant which we asssembled to mine the submerged placer gravel reserves on the Fortymile River. The trommel, conveyor and pump are powered by an electrical generator mounted onboard the barge. The photograph at the right shows a floater dredging operation on a frozen bench. By establishing a long (approximately 300 m) pond on a permafrost bench, we are able to get enough natural thaw of gravel at the cut face to sustain a mining operation. Water is pumped from the river a vertical distance of approximately 15 m to fill the pond.